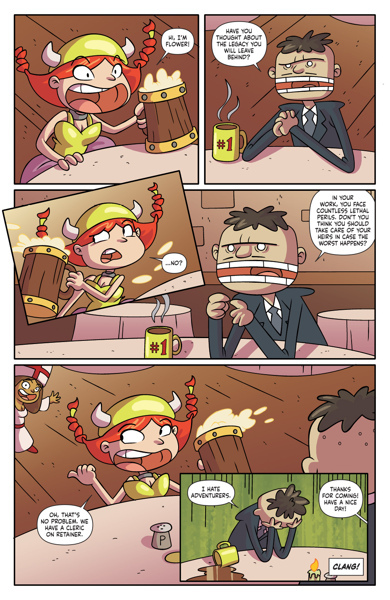 Daily Illuminator: Munchkin Comics #24 Out Now! December 28, 2016: Munchkin Comics #24 Out Now! Superheroes rejoice, the day is here! Munchkin #24 from BOOM! Studios is out now at your local comic shop! This double dose of funny has stories featuring Super Munchkin Guest Artist Edition and . . . speed-dating? Spyke and Flower try their hand at love in "You Meet at the Tavern . . .". Written by our own Munchkin Czar, Andrew Hackard, and drawn by Phil Murphy, we see the munchkins in their natural habitat: a tavern full of enemies . . . er, I mean, potential dates. Will Spyke survive his run-in with an ex-Ghoulfiend? Will Flower finally fall for an Insurance Salesman? Well, if I told you that, you wouldn't buy the comic, would you? 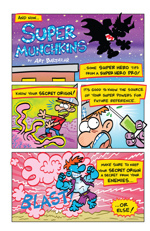 Art Baltazar enters the fray with "Super Munchkins," a super-powered story in his own style, just like his Guest Artist Edition! 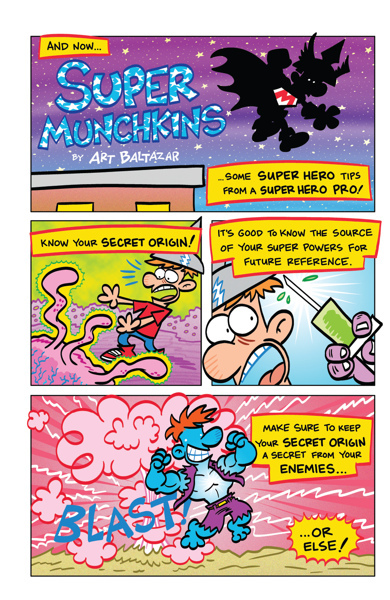 If you've ever wanted to know how to be a Super Munchkin, Art's guide is a great start. Learn your geometry; trajectory is important with your throwing shields! Pick up issue #24 at your friendly local comic shop today! Check the back for a special rule, and for a code to get the BOOM! Bookmark bundle, plus a few promo cards, on Warehouse 23.